Well, I've been saying something to the boy every so often about turkey season opening but haven't asked him if he wanted to go. The past few years he hasn't been real interested in hunting so I've not been pushing it. Yesterday, the wife had to go out of town to Chicago for work, so the boy and I were on our own last night. As we were waiting on our pizza and wings to get done at Pappa Johns, I looked at the weather on my phone and said something about it being cooler this weekend but still being OK, and then asked him if he was going to go turkey hunting with me. "Yeah"
Crap! I hadn't planned on that! Sent the wife a text today and told her to get him a pair of boots that would fit him. I stopped today and got a push button turkey call that he could use and some shells for his gun. I got choke for his 20 gauge last year, but since he didn't want to go, I never bothered getting shells and patterning the gun. So from the way things are shaking out though with as busy as things are for everyone, I'm going solo opening day. The boy has a karate belt test that he has to take on Saturday. Sunday, he and I will hunt together, but I won't have time to have patterened his gun, so if he wants to shoot, I'll take the crossbow for him to shoot. I know it's dead on. Next weekend, he has a karate tournament we've got to go to on Saturday, but then we'll go hunting on Sunday. I'll have his gun patterened by then. The next weekend, right now anyway, there's nothing planned except hunting for either of us. To add to this, I offered to call for my adult cousin that doesn't turkey hunt but is wanting to get into it. So sometime I'm going to have to make time to squeeze him in. I told him to just get his tags. We can hunt his land, he can use my gun, and I'll call for him. To me, just calling them in is just as much a thrill as pulling the trigger. For him, once he hears one of them big thunder chickens cut loose within 40 yds, he'll be hooked! OH HAIL YEAH, you the man BC 2 rookies in the same season ? Thats being an Ambassador of the Sports. Go get'em ! BC! Nice going! I hope you get some hunting time in for yourself, too. I'm also glad you have your son in Karate classes. It's refreshing to see parents doing all they can for their children. The boy isn't "exactly" a rookie. He went with me a couple of years ago when I busted one. I had at least 2 birds coming in but didn't know what they were. Mason was wanting to call, but I didn't have anything but a glass call that he could use (it was raining) and I was using it. I wouldn't let him try with it because I didn't know what the birds were. Looking back on it, I should have let him give it a shot. That's why, come hell or high water, I was going to find him a push button call that he could use. Yeah John, he really enjoys the karate. So far it's paid off pretty well too. Back last fall a kid grabbed him around the throat on the playground at school. He quickly proceeded to give him 2 quick punches to the face to get him to let go, resulting in a bloody nose for the kid and a severely bruised ego. Normally, kids would get suspended for fighting, but there were enough witnesses to it that backed up Mason's claim that he was defending himself that they didn't do anything to Mason. I think the other kid got something out of it though, besides the bloody nose. He's a purple belt right now. I think it's his blue belt that he's testing for on Saturday. From the looks of things, tomorrow is probably going to be the only day that I'll have to try to get a bird for myself. That's OK though. I'd rather Mason get them anyway. I'll still get to eat them, so I'm a winner any way you go at it. As for my cousin, I think he's around 28-30 years old or so. If I can get him into turkey hunting, great! The thrill is in being able to call them in. The shot is anticlimactic. His father-in-law just bought about 140 acres of ground not too far from our farm and Michael is basically the caretaker over it. I know "about" where it's at, and if it's at where I think it is, it's going to be loaded with turkeys. Calling for him will let me pass on the addiction, feed my own addiction, and I won't have to get punished by that shotgun! WAY TO GO MASON!! Don't take crap from anybody!! He chokes you. You kick him in the ya-ya and then punch him in the larynx!! He and EVERYONE ELSE will know not to miss with you!! I didn't get into martial arts until I was 15. The boys got a jump on everybody!! Hey BC!? Your son might grow up to be just like me!!! Way to go for both! I bet they have some squirrels in that new place, BC. Yeah, there's a few squirrels there. Michael's dad (my uncle that taught me how to hunt) has already laid claim to the squirrels though. Well, this weekend was a bust. I saw 1 hen when I was walking in Saturday afternoon and that was it. I didn't hear any gobbles all weekend, even off in the distance. This late spring must have them screwed up. Normally when turkey season opens around here, everything has greened up and the dogwoods are blooming. Everything is just now starting to get green and the redbuds are just now starting to bud out. The dogwoods haven't even thought about coming out yet. Even if there aren't any gobbling on our land, I'll usually still hear some off in the distance. I didn't hear anything all weekend! Only heard maybe 15 shots all weekend and that was it. Normally, I'll hear that many within 2-3 hours on opening morning. From what I've been reading on another board, it's kinds of hit or miss across the state as to whether or not they're gobbling. The southern part of the state, they're gobbling. Central on up, nothing. Kind of had a feeling that it was going to be like this though. Normally, when the boy and I are leaving for school in the mornings, we'll hear some gobbling there by the house. Haven't heard any yet this year. 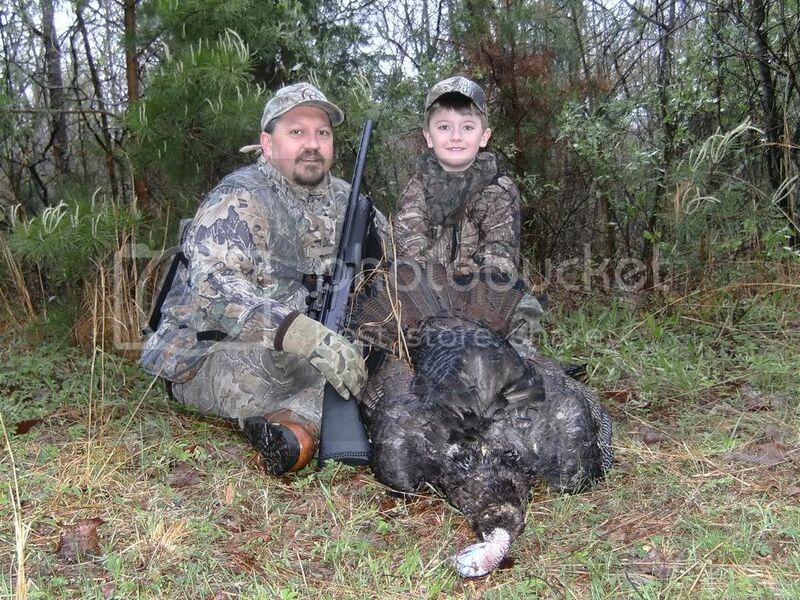 Mason didn't hunt with me Sunday. He didn't want to go. The only thing that I can figure is that it was because I didn't have his shotgun patterned. I told him that he could shoot the crossbow, but apparently he didn't want to do that. He's going to go with me this next weekend though. I'll have his gun patterned by then. Got to looking back at some pictures from last year and there's a world of difference between this year and last year. I took a couple of pictures Saturday morning and thought I had them here at work, but don't. Below are 2 pictures for comparison though. One I took last year on 4/15/12. The other one was taken 4/6/13 by my trail cam. Notice what I was saying about the late spring this year? That's the only thing I can figure for the the birds being so screwed up around home. I've hunted them every year for probably 20 years down there. I KNOW how the birds act down there. This year, they're all screwed up! Here;s one of the pictures I took from this past weekend, 4/15/13. Same area as the first picture above, within 20 yds.